Construction of a striking 120 metre tower housing U2's studio in Dublin has been suspended. Proving that even multi-millionaire rock bands aren't immune to the worldwide financial crisis, "uncertainty in the property and financial markets" will delay the project for at least 12 months. A consortium including British architect Norman Foster and U2 was selected a year ago to build the tower, situated at the mouth of Dublin's River Liffey. U2's recording studio was to be suspended at the top in an egg-shaped pod. The development, which would have been Ireland's tallest building, was also intended to include a public viewing platform, a hotel, retail and residential accommodation. "The objective is to see this landmark project completed. However, given the current unfavorable economic environment, more time is needed at this juncture." 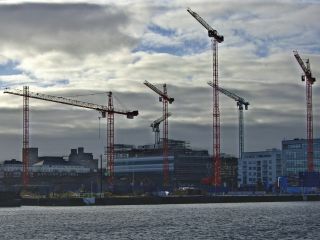 The Dublin Docklands Development Authority commented: "The objective is to see this landmark project completed. However, given the current unfavorable economic environment, more time is needed at this juncture." The news follows reports that the New Jersey Nets, a basketball team co-owned by Jay-Z, look less and less likely to move to a planned new arena development in Brooklyn.